Celtic Thunder returns with Celtic Thunder X, a show that celebrates 10 years of old songs and new. 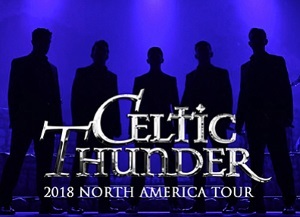 Backed by the amazing Celtic Thunder Band, the singers (Damian McGinty, Ryan Kelly, Michael O'Dwyer, Emmet Cahill & Neil Byrne) deliver new ensemble numbers including "Sons of Light," "Toora, Loora, Lay," "The Wild Rover," and "Castle on the Hill." The second act brings nostalgic fun including "Celebration," "I'm a Believer," "Seasons in the Sun," and "Rise Again." And no Celtic Thunder show would be complete without an encore of their rousing anthem "Ireland's Call."